This past week, Parker, Smith & Feek hosted our second manufacturing human resources roundtable to discuss recruiting and retaining millennials in the manufacturing workspace. As the manufacturing industry faces an aging workforce coupled with continued growth, companies are looking for millennials to fill the job gap. 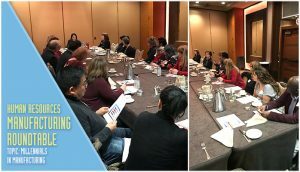 The goal of our roundtable was to give those in a human resources or similar role the opportunity to share ideas, concerns, and general questions with an expert in employment advice as well as their peers, and discuss insights from Jenifer Lambert on what the millennial demographic is looking for in an employer. A special thanks to Jennifer Lambert with Terra Staffing who explained the generation gap and specifically what companies need to know about attracting and retaining millennials. Thank you to Vicky Bajwa with True Brands for moderating the session. The hardest obstacle manufacturers face is the generational gap; either they are implementing technology and alienating their existing workforce, or they are being overlooked over by millennials who see lack of technology as old and not a good fit. With over 76,000 jobs in our state ready to be exited over the next five years due to baby boomers leaving the workforce, millennials will have an enormous opportunity to land well-paid manufacturing jobs and fill the gap in the workforce. It is becoming increasingly urgent that manufacturers bridge the gap of how to attract the millennial generation quickly. Stay tuned for more information on our next human resources roundtable from our Manufacturing Practice Group! More information to follow.